At the crossroads of corporate strategy and finance lies valuation. And in today’s economy–whether you’re a seasoned manager or a budding business professional–it’s essential to excel at measuring, managing, and maximizing shareholder and company value. Valuation, hailed by financial professionals worldwide as the single best guide of its kind, will show you how to do just that and much more. With this new edition, there will be 3 sections.The first section provides a detail overview on corporate valuation and insights on the strategic advantages of value-based management that are of interest to practitioners.The second section is a complete and comprehensive valuation course, ready-made for detailed instruction and learning by both professionals.The third section concentrates on additional insights and nuances that managers should know about valuation and valuation techniques, as applied to companies in different industry, emerging markets, and other special valuation situations. As usual, “Valuation” will help you: Decide among alternative business strategies by estimating the value of each strategic choice.Develop a corporate portfolio strategy, based on understanding which business units a corporate parent is best positioned to own, and which might perform better under someone else’s ownership.Assess major transactions, including acquisitions, divestitures, and restructurings.Improve a company’s performance management systems to align an organization’s various parts to create value.Design an effective capital structure to support the corporation’s strategy and minimize the risk of financial distress. McKinsey & Company’s #1 best-selling guide to corporate valuation, now in its sixth edition “Valuation” is the single best guide of its kind, helping financial professionals worldwide excel at measuring, managing, and maximizing shareholder and company value. 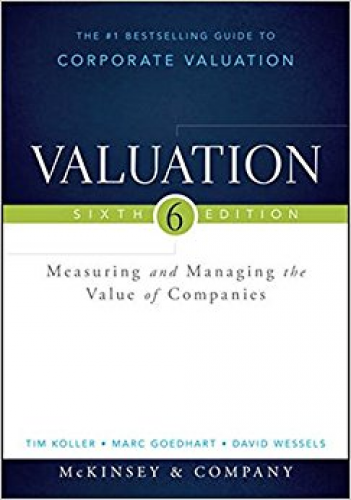 This new sixth edition provides insights on the strategic advantages of value-based management, complete detailed instruction, and nuances managers should know about valuation and valuation techniques as applied to different industries, emerging markets, and other special situations. Valuation lies at the crossroads of corporate strategy and finance. In today’s economy, it has become an essential role — and one that requires excellence at all points. This guide shows you everything you need to know, and gives you the understanding you need to be effective. Estimate the value of business strategies to drive better decision making Understand which business units a corporate parent is best positioned to own Assess major transactions, including acquisitions, divestitures, and restructurings Design a capital structure that supports strategy and minimizes risk As the valuation function becomes ever more central to long- and short-term strategy, analysts and managers need an authoritative reference to turn to for answers to challenging situations. “Valuation” stands ahead of the field for its reputation, quality, and prestige, putting the solutions you need right at your fingertips.